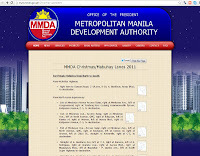 Christmas is fast approaching and I am sure that you would agree that it is synonymous to HEAVY TRAFFIC! Shopping left and right would be the main culprit for worsening the already nightmarish traffic here in the metro. But then again there goes our MRT to the rescue.... errr... but if you have gift wrapped goods already i suppose that you wouldn't want you gifts to be opened just to get on the train right? Well if you have a car lucky you (well kind of) as the MMDA opened Christmas Lanes for vehicles to use to avoid the traffic. These are alternate lanes on the side streets away from the traffic of EDSA. You can access the alternate routes through the MMDA website or by clicking through this direct LINK. And oh you can print the maps too! I know that traffic here in this megacity that we are living is far from ideal but taking these alternate routes would surely cut us some slack and make our trips a little easier.